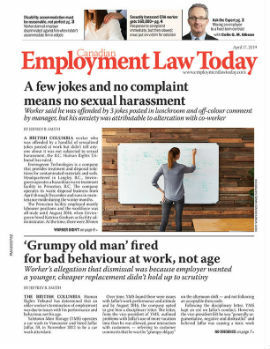 A 75-year-old worker’s claim for wrongful dismissal damages has been refused by a Quebec court because he didn’t mitigate his damages by accepting another position with his former employer. Abraham Levy worked for Standard Desk, a wooden furniture company in Laval, Que., from 1971 until 2009, when the company closed its plant. Standard Desk provided eight weeks’ notice and offered Levy a position with another company it owned in Granby, Que., with similar duties and pay. The company also said it would provide a free shuttle to Granby for all employees who transferred there. Levy felt that at his age, he couldn’t make the daily trip to Granby and it was unlikely he could find another job. He refused the offer and filed a wrongful dismissal suit, claiming $100,000 of pay in lieu of notice and moral damages. The Superior Court of Quebec found Levy’s length of service, position and age would entitle him to 14 months’ notice on top of the eight weeks he had already received. However, it also found that, despite Levy’s advanced age, Standard Desk’s job offer was reasonable. Since Levy he didn’t plan to retire, he was obligated to make a reasonable effort to find similar employment. By refusing Standard Desk’s offer of another similar position, Levy failed to live up to that obligation, said the court. The court denied Levy’s claim for wrongful dismissal damages due to his lack of mitigation. •Levy c. Standard Desk Inc., 2012 CarswellQue 7534 (Que. S.C.) (Fr. ).